Do you know someone who spends far too much time on StumbleUpon? Do they sit in a dark haze with their finger permanently implanted on the "stumble" button? Do they swear they can quit at any time? Are they known for doing an impression of ring announcer Michael Buffer shouting "Let's get ready to S-T-U-M-B-L-E"?!? If you answered yes to any of these questions, your friend may be a Stumbleholic. 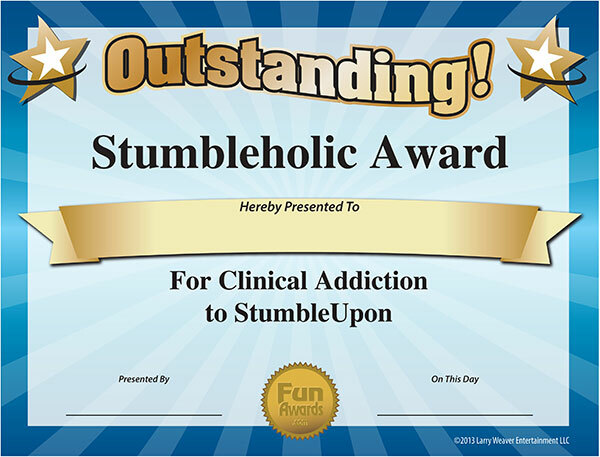 Show them you acknowledge their time wasting affliction with this free funny award. Download the certificate, type in their name, and post it on their office door or cubicle.